No Tips. No Trips. 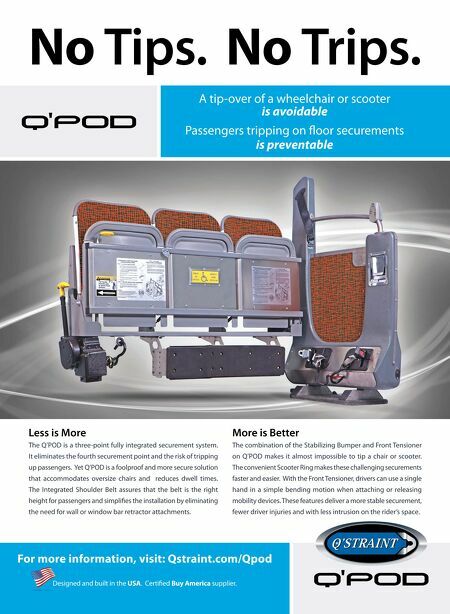 A tip-over of a wheelchair or scooter is avoidable Passengers tripping on foor securements is preventable Less is More The Q'POD is a three-point fully integrated securement system. It eliminates the fourth securement point and the risk of tripping up passengers. Yet Q'POD is a foolproof and more secure solution that accommodates oversize chairs and reduces dwell times. The Integrated Shoulder Belt assures that the belt is the right height for passengers and simplifes the installation by eliminating the need for wall or window bar retractor attachments. More is Better The combination of the Stabilizing Bumper and Front Tensioner on Q'POD makes it almost impossible to tip a chair or scooter. The convenient Scooter Ring makes these challenging securements faster and easier. With the Front Tensioner, drivers can use a single hand in a simple bending motion when attaching or releasing mobility devices. These features deliver a more stable securement, fewer driver injuries and with less intrusion on the rider's space. For more information, visit: Qstraint.com/Qpod Designed and built in the USA. Certifed Buy America supplier.